Our neighborhood has a pretty cool, good old-fashioned, house-to-house-on-the-night-of-Halloween Trick or Treating system going on. And we love it! So far, we have participated in the spooky decor every Halloween we've been here (this will be our second). 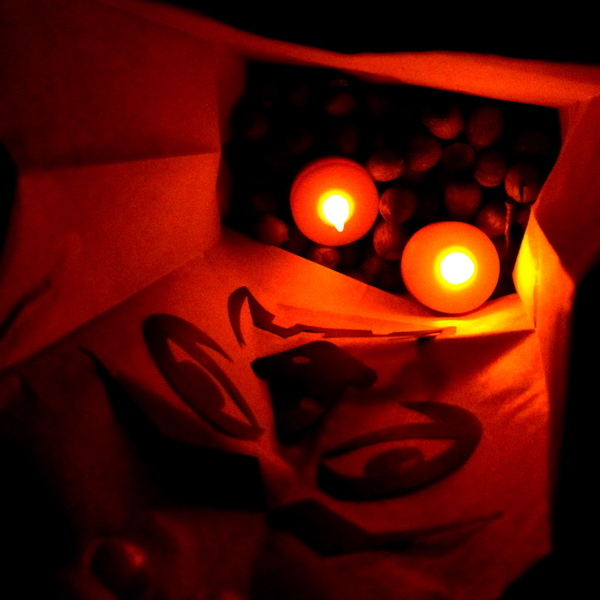 However, last year my incredibly ingenious and Halloween loving friends lent us many of their own homemade props and creatures and spooky stuffs with which to decorate: lights, rats, spiders, tombstones, etc., etc. This year, they will be unable to help out, so I'm trying to make a bunch of my own spooky decor to add to what we have already, without breaking the bank. 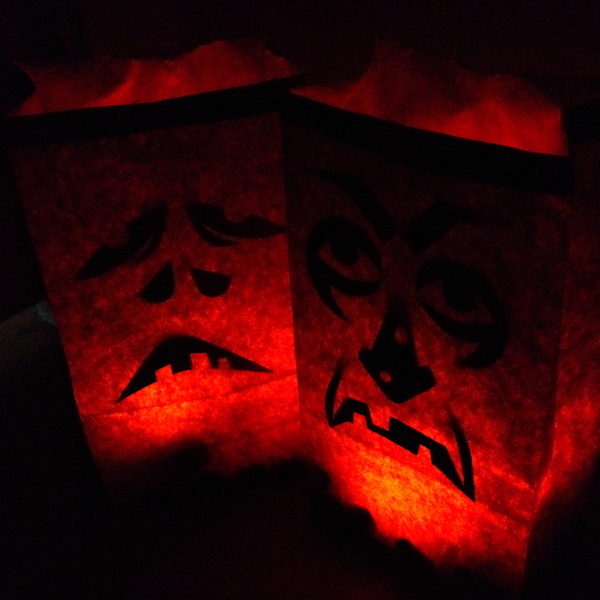 So instead of solar Halloween stake lights, or my friends' ultra cool creepy lanterns to light the sidewalk, I did some research on what I could do for my own DIY luminaries. I came upon this post by Designs by Sharon. So many luminaries I looked up were painted or printed on the bag, but I liked the way her cut cardstock luminaries looked in the light. Plus, I already had everything I needed! What the inside looks like. She used her Cricut to make spooky shapes on cardstock to stick on the inside of an illuminated bag, but I decided I would just wing it and draw up and cut out my out frightening facial features for my luminary guys and ghouls. I used a rolling sticky tape I have had sitting around (but I've never used), stuck the designs on the inside of the bag, found another use for my yard full of acorns (to weigh the bag down and set the LED candles on them), and stuck two LED flickr candles inside. They actually give off a decent amount of light (despite being difficult to photograph with my phone - too lazy to get the camera out today). And there you have it, Halloween luminaries! Simple, spooky, and cheap, just the way I like 'em.